LOS ANGELES, CA. 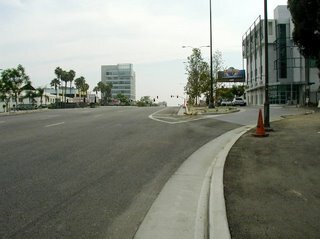 – The Santa Monica Boulevard Transit Parkway is the largest roadway project in the City of Los Angeles. Only 4 Kilometers in length, the Parkway is not very long, but with 3 lanes of travel in each direction, frontage roads on either side and ingress and egress points throughout, it’s obvious that the designers were serious about moving some automobiles rapidly through this neighborhood. The Parkway runs east-west on Santa Monica Boulevard from the border of Beverly Hills (Moreno Drive) on the east side to the 405 Freeway (Beloit Avenue) on the west side. Conceived about a decade ago, this project counts as its “parents” the Federal Highway Administration, the State of California, Los Angeles County, the Metropolitan Transportation Authority, the City of Los Angeles Department of Public Works and the City of Los Angeles Department of Transportation. These heavyweight project partners threw down $75 million fully intending to address the 2nd most congested corridor in the City of Los Angeles by encouraging multi-modal travel by featuring walkways, bike paths, and enhanced bus transit operations. The local community has been told that the Parkway will result in a 20% increase in auto capacity but that it will not result in an increase in traffic, that it will only serve to reduce drive time. Locals complain that the pedestrian opportunities look minimal, the enhanced bus operations look like bus pads on any other busy boulevard, the bike paths have been replaced by bike lanes using a 2002 striping plan that does not incorporate any of the recent State of California adopted design standards. With the conclusion of construction in sight, the current tab is at $90 million. Intersection cement is being poured, the landscaping is nearing completion, and once the final surface is set the striping will go down and we are off to the races! There have been many concerns raised by the community along this journey and one significant issue still remains on the table. This is the final striping plan. The Parkway is designed to move cars. One might suggest that the design includes elements of “Frogger” with the cyclists playing the Frog. Vehicle Code requires that cyclists use a bike lane when one exists (with exceptions for debris, safety and left turns) and SMBTP has plans for a 5’ (including 2’ gutter pan) Bike Lane. Concerns have been raised that this will result in “engineered conflict” because of the freeway style egress lanes that take autos across the bike lanes at full speed. Who has right-of-way? An auto in a lane that is engineered to encourage a veering exit with no reduction in speed until safely on the frontage road or a bicycle in the bike lane desiring to maintain a straight through line? The striping plan on the table at the last community meeting had no signage or lane markings in the intersections that would clarify any right-of-way conflict. There is little time left to act and our actions will have long term ramifications. Call City Council President Pro Tem Wendy Gruel (CD2), who chairs the Transportation Committee, and ask her if the largest Roadway Project in the City has been reviewed by the Committee. (213-473-7002) Call her legislative deputies, Christopher Olsen and Jennifer Cohen, and ask them if Wendy’s office can vouch for the efficacy and safety of the Santa Monica Boulevard Transit Parkway bike lanes. Call City Councilmember Jack Weiss (CD5), whose district includes the Parkway, (213-473-7005) and ask him if he is confident that the bike lane striping plan contains the most recent approved signs, signals, and pavement markings for the State of California and the City of Los Angeles. Call his Senior Field Deputy Paul Backstrom (310-289-0353) and ask him if the autos using the egress are in conflict with the bicycles in the bike lane. Call Gloria Jeff, the General Manager of the Department of Transportation, (213-972-8480) and ask her if the Santa Monica Boulevard Transit Parkway incorporates all the design elements necessary to ensure safe travel for cyclists. Ask Gloria if the LADOT Bikeways department participated in the process and if the final result includes all of their recommendations for cycling safety. 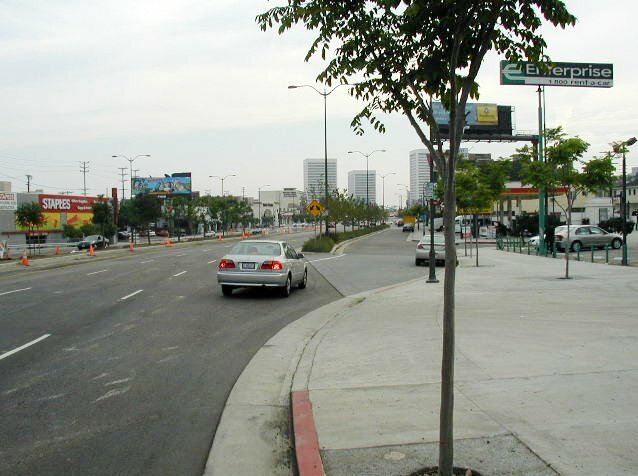 Call Michelle Mowery of the LADOT Bikeways Department (213-972-4962) and ask her if the recommendations of the Los Angeles Bicycle Advisory Committee have been incorporated into the final striping plan. If it is, then enjoy your ride! 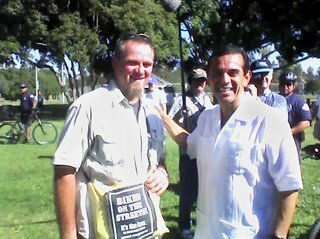 If it falls short of what you think a cyclist should expect for $90 million, then pick up the phone and call Mayor Antonio Villaraigosa (213-978-0721) and then call Jaime de la Vega, Deputy Mayor of Transportation, (213-978-2360) and then call Maria Rangel, Administrative Assistant, (213-978-0648). Let them know that you are a cyclist and let them know that you expect a $90 million Parkway to be the safest, most efficient and comfortable stretch of bikeway in the City of Los Angeles. Settle for nothing less. You paid for the best! Stuck in the bikelane again..."
LINCOLN PARK, CA. – Stephen and Antonio pause in Lincoln Park to discuss cycling issues in Los Angeles. “That’s right! Cyclists belong on the street!” says Mayor Antonio Villagairosa. Escorted by some of Los Angeles’ finest on bicycles, the Mayor and several hundred of his closest friends were celebrating LA’s 225th birthday by walking with Los Pobladores from San Gabriel to el Pueblo Historical Monument. The nine mile walk commemorates the 1781 trek made by the original Los Pobladores, the original Spanish settlers of Los Angeles. CD4 High Visibility Bicycle Racks! TOLUCA LAKE, CA. – Never one to settle for “subtle,” Los Angeles City Councilmember Tom LaBonge has the latest model of vanity bike rack installed in Toluca Lake. This rack gets points for being highly visible, for accepting a variety of locks, for being in a high foot traffic area, for supporting the frame of the bicycle, for being simple to use and for being in a clean, well maintained area. Thanks for the bike rack Tom! The LADOT Bicycle Program installs bicycle racks in the public right-of-way (City Property) to encourage bicycling as a transportation option. There is no fee for a rack. Now, there is no excuse for not having a bike rack. LOS ANGELES, CA. – A little over a year ago, Councilmember Tom LaBonge and Rec & Parks GM Jon Kirk Mukri responded to community protests over the 2003 Griffith Park Master Plan Draft by forming a Working Group with the mandate of preparing a “revised” Master Plan Draft. The meetings are monthly, open to the public, somewhat contentious and consistently long with public comment coming at the end of a typically long evening. John Gray, President and CEO of the Autry, was braced for confrontation and came with quite an entourage, all as a result of the controversy over the assimilation of the Southwest Museum and its assets into the Autry family. Our friends at the Autry were quick to reach out to the cyclists in the room by pointing out that their restrooms are kept open before and after Autry Museum operating hours for the convenience of the cyclists in the park. I urge readers to call John Gray (323-667-2000) to thank him for providing access to the Autry rest rooms and to encourage him to provide appropriate and effective bicycle parking at the Griffith Park Campus of the Autry National Center. John Lewis, General Manager of the Los Angeles Zoo, was next to present and his vision for the LA Zoo was captivating and exciting. This is not to say that it was without conflict. Plans call for a 17 million dollar parking lot replacement, tapping into Prop “O” money. I pointed out that Rec and Parks has gone on record as saying that 10 million dollars for shuttle service throughout the park is cost prohibitive. How then would investing in the future of free parking with a price tag of 17 million be a reasonable advantage? Before I could yell “Free the Elephants, not the Parking Lot!” John had moved on and was discussing the attractions. 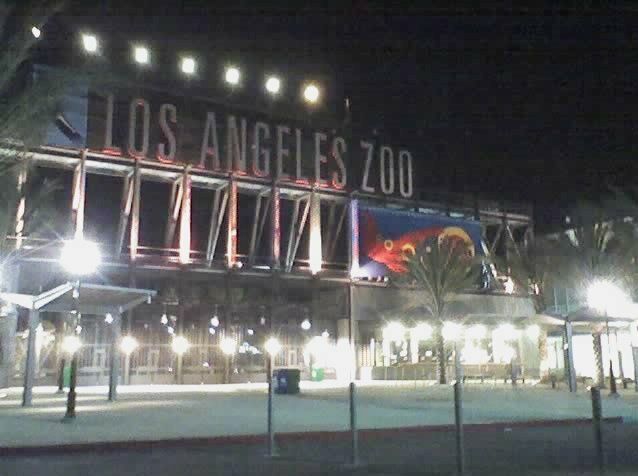 After the presentation I spoke to John about the huge illuminated LA Zoo sign (situated in the middle of an urban wilderness, adjacent to the Observatory, illuminated only after the zoo has closed!) and the lack of appropriate bicycle parking. John was quite amenable and took copious notes. I was pleased to note (see pic) that the simplest of the requests (turn off the sign) was handled immediately. 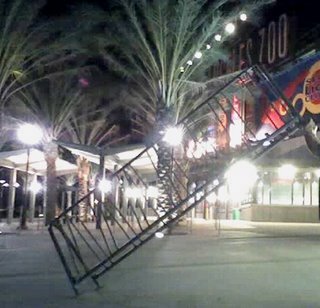 Again I urge readers to pick up the phone, this time to call John Lewis (323-644-4200) to thank him for turning down the lights and to encourage him to provide appropriate and effective bicycle parking at the Los Angeles Zoo. 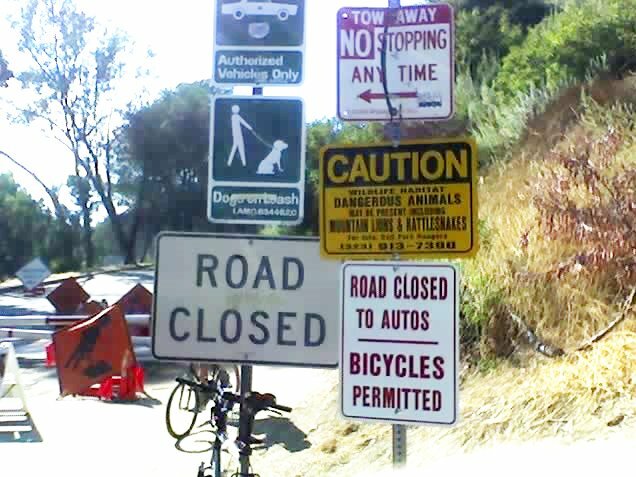 ROAD CLOSED TO AUTOS – BICYCLES PERMITTED! LOS ANGELES, CA. – In a deft display of efficiency, Patty Malone, Field Deputy for City Council Member Tom LaBonge, responded to cyclists’ complaints of restricted access to Mt. Hollywood Drive in Griffith Park by picking up the phone and having signs installed that settle the issue. Mt. Hollywood Drive has been closed to automobiles for years and, consequently,has become a very popular route for both cyclists and hikers. “Perhaps you might not be aware, paved roads in Griffith Park are accessible to recreation and commuter cyclists during park operating hours? 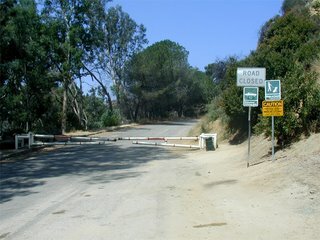 The north-south access within Griffith Park is Mount Hollywood Drive, a paved road which connects the Park's northwest corner via Oak Canyon Drive (from either the Travel Town Museum or the Mineral Wells Picnic Area) to the Griffith Observatory and Los Feliz/Hollywood (via Vermont Canyon or Western Canyon). Mt. Hollywood Drive is open to bicyclists, as is Vista del Valle Drive, which is the paved, upper mountain route which parallels the Park's east-west mountain ridge from Mt. Hollywood Drive to the Commonwealth Nursery (Commonwealth Avenue). I pointed to Tom that the large “ROAD CLOSED” sign does not seem to support his thundering endorsement of a cyclist’s right to ride Mt. Hollywood and that it would seem ill-advised to advise cyclists to ignore road signs in any circumstance. Silence. Crickets. More silence. A year passes and Mt. 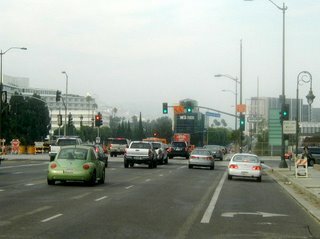 Hollywood Drive is now busy with construction. The Department of Water and Power is building a retaining wall and installing new pipe along the roadway. There is some conflict and confusion between the Department of Water and Power flagmen and some cyclists. Phone calls are made to the DWP. Phone calls are made to the Griffith Park Rangers Station. Appeals are made at the Griffith Park Master Plan Working Group to Rec & Park staff. All to no avail. REOPENING ACCESS PLAN REVISED TO INCLUDE CYCLISTS! LOS ANGELES, CA. 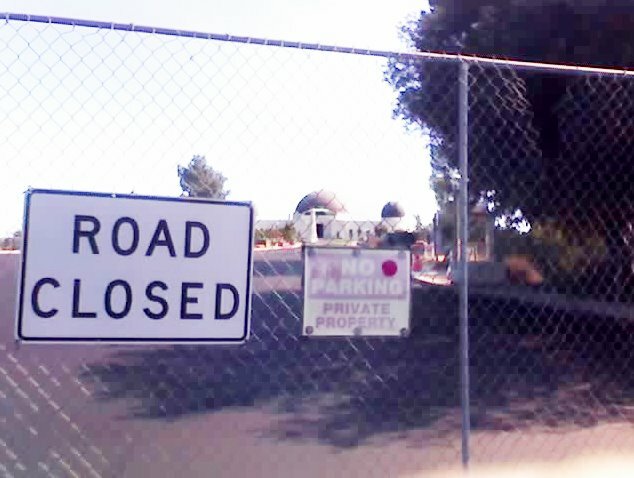 – Jon Kirk Mukri, General Manager of the Department of Recreation and Parks, announced that a plan to require all guests of the Griffith Observatory to use shuttle buses ($5.50 per guest) has been revised to include a cyclist and pedestrian access option. The Griffith Observatory has been closed since early 2002 for a complete overhaul and renovation. Excitement has been building and the Department of Rec & Parks has been concerned that demand for access far exceeds the capacity of the Observatory and also of the neighborhood. To their credit, Rec & Parks came up with a very progressive plan that incorporated a complete ban on automobile access. Guests would use a timed entry advance reservation system and then board shuttle buses at one of two off-site locations so that the impact on the community was minimalized and that the flow of guests at the Observatory was controlled. The downside of this plan was that it provided no mechanism for allowing guests to access the observatory without using the shuttle buses. Cyclists and hikers were outraged. Officials argued that cyclists and hikers would still have access to the park, they conceded that access to the Observatory would still require boarding a bus at Hollywood/Highland or the LA Zoo. Local cyclists have lobbied for over a year to have the plan revised. Stephen Box, a Los Angeles County Bicycle Coalition Boardmember, has appealed to the Mayor’s office, City Council President Eric Garcetti, Councilmember Tom LaBonge, the Griffith Park Master Plan Working Group, the Department of Rec & Parks and just about anybody else who would listen as well as a few that wouldn’t. Colin Bogart, LACBC Board President, and Enci, LACBC member, joined Stephen at the Friends Of The Observatory community presentation where all three spoke in protest of the exclusion of cycling as a viable transportation option. Stephen and Enci were joined by Kastle Lund, Executive Director of the LACBC, at City Councilmember Tom LaBonge’s Mobility Action Committee where they all spoke in favor of a revised Observatory access plan that includes cyclists and pedestrians. Stephen attended the Rec & Parks Commission meeting this past week intending to speak again on the issue but was assured by Jon Kirk Mukri and Kevin Regan, Assistant General Manager, that cyclists would still need to use the advance reservation click and print system but that they would be able to ride to the Observatory. Vicki Israel, Griffith Park Superintendent, added that bicycle racks were going to be installed and went on to inquire as to the best cycling and pedestrian routes to the Observatory. The two most popular cycling routes to the Observatory are the Ferndell/Western Canyon route (2.3 miles) and the Vermont Canyon route. (1.6 miles) Once at the top you can continue on Mt. Hollywood Drive (closed to automobiles for years!) and ride for miles surrounded by nothing but the beauty and tranquility of Griffith Park. LOS ANGELES, CA. - Early morning cyclists traveling south on La Brea Avenue were shocked to discover that the bicycle lane beginning at Redondo Boulevard had disappeared overnight. Upon closer examination of the crime scene it was determined that this was no prank but was the work of professional thieves. Investigators pointed to the thoroughness and precision of the lane removal and the fact that absolutely no trace of the bicycle lane was left behind, save for the “Bike Lane” signs posted along the route. Apparently, the shortage of bicycle lanes in Los Angeles has resulted in a high salvage or resale price for used bicycle lanes. The lanes are taken to chop shops, dismantled and then resold. When asked why the thieves consistently remove all traces of the bicycle lane from the street but leave the “Bike Lane” signs in place, officials responded that the signs are so widely ignored by motorists that they have no market value. Phone calls to the LA Department of Transportation Bikeways department (213-972-4962) yielded a recorded message inviting the public to visit their website. The City of Los Angeles 311 City Services directory was quite helpful in connecting concerned cyclists with different city departments but none of the calls yielded any useful information. Further calls to the DOT (213-485-4184 option 2) yielded extremely helpful operators that were happy to take reports on traffic signal sensors that fail to detect the presence of bicycles but were hard-pressed to explain what to do when a bicycle lane disappears. 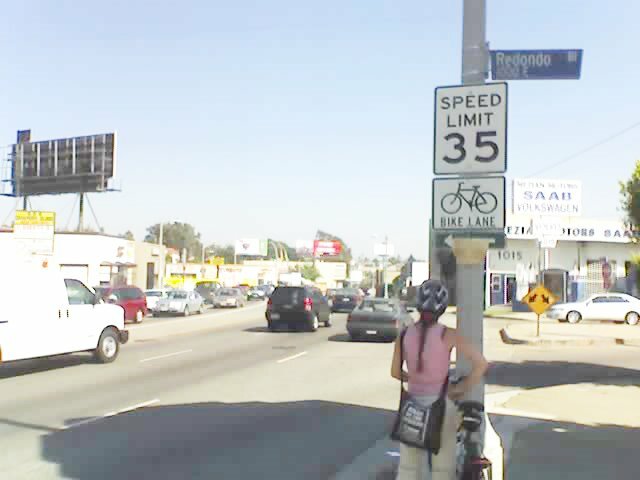 Department of Street Services Senior Investigator Marcia Jackson (213-485-3711) referred calls to the DOT Bikeways department reporting “They have a website. I don’t know the address but it’s on the internet.” Ms Jackson explained that Street Services would only be interested in the situation if the bicycle lane was blocking the sidewalk. Once reassured that the bicycle lane was not on the sidewalk, she lost interest. Calls to the Metro yielded a workaround solution that consisted of simply getting off the road and riding the bus. When it was pointed out that the bus bike racks only hold two bikes, the customer service operator suggested that concerned cyclists call Metro Customer Service and advocate for the new three-bike racks. At this point, the Lead Investigator rolled his eyes, tipped his cap and was last seen gripping the bullhorn bars of a bright green 44/12 fixie as he pedaled off into the traffic.